I'm down to the last week of maternity leave and I can hardly believe that 12 weeks went by so quickly. At the beginning I definitely had grand plans of all I was going to accomplish on my time at home. A lot of those things included house cleaning projects and organizational tasks that I never seemed to get around to on the weekends. I still haven't gotten around to them, because I've learned that babies are a lot of work and no cleaning project is as fun as cuddling with my little girl. As the days dwindle down I'm trying to make the most of my time at home. I think Amelia is starting to wonder why her mom keeps hugging her tight, periodically kissing her little hands and feet and telling her she is the cutest baby in the world. Meals have definitely gotten more regular around our house, and it is only occasionally that we have cereal for dinner. I still try to find meals that are fast to throw together and won't be ruined by dropping everything in the middle of dinner prep to calm a crying baby. That's why this Mexican chicken salad recipe works well for us. It is fast and easy, and anything Mexican-inspired is a good fit in our house. If you use rotisserie chicken for the shredded chicken there is no cooking involved - a big bonus in the summer. Plus, it is easily customized to different tastes by adding or omitting toppings of your choosing. A final bonus of the recipe is that it makes good use of avocados instead of mayo, which makes it more tasty and more appealing to mayo haters. I'm a fan of avocados in just about everything. I get requests sometimes to endorse certain brands and products on this site and I don't often accept those requests because I either don't have time or don't love the product. Avocados, though, are something I use a lot so I have no problem passing on a link to Avocados from Mexico's website where they have a collection of recipes using avocados. You can submit your own recipe like I've done with this recipe here, or you can search through recipes that other people have submitted. There are also ringtones and wallpapers to show your crazy love for avocados, which is just plain awesome. 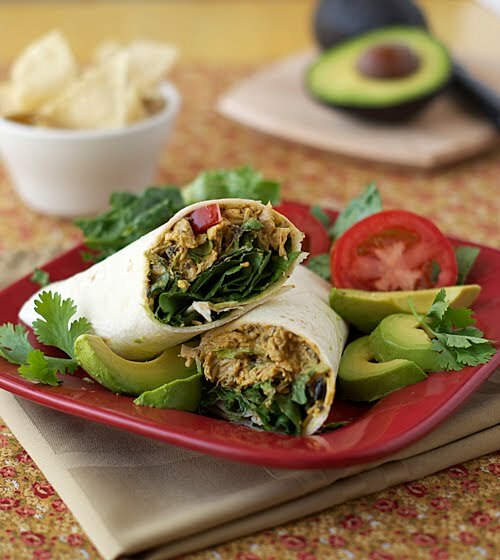 If you are an avocado fan, you will definitely find something on the site to enjoy. Slice each avocado in half and remove the pit. Using a spoon, scrape the flesh from 3 halves into a blender. Add the sour cream, lime juice, chili powder, garlic powder, onion powder, oregano, cumin, salt and hot pepper sauce and blend until smooth. Pour blended avocado mixture into a large bowl and add cilantro and shredded cooked chicken. Stir until well mixed. 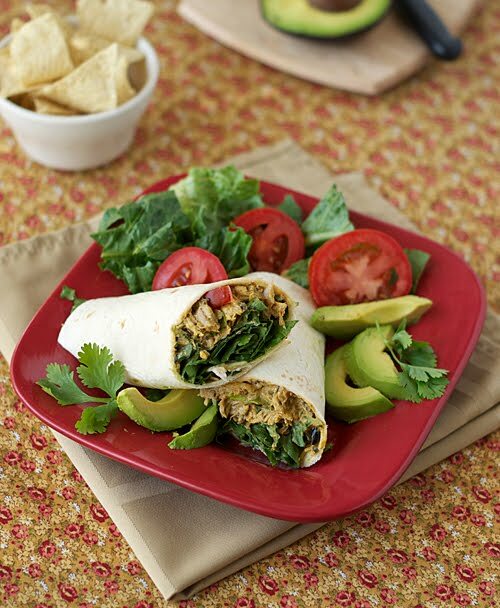 Divide chicken salad mixture among the flour tortillas. Scoop out the flesh from remaining avocado half and divide among each tortilla. Top with remaining romaine, tomatoes, cheddar cheese, black beans and corn. Roll tortillas tightly and cut in half. Serve immediately. Recipe Source: heatovento350. This sponsorship is brought to you by Avocados From Mexico who we have partnered with for this promotion. i have never seen a recipe like this! i am so excited & inspired! This is my kind of chicken salad. I hate mayo and love Mexican food. That is one yummy looking recipe. Great picture. What a great recipe for busy weekday lunches or dinners! These wraps look absolutely delicious. Thanks for sharing, Nicole. It is partly brown from the chili powder so you don't notice the avocados browning as much if you store it. Plus the lime juice helps slow down the browning. I prefer to eat it right after making it, but I've saved the leftovers and they are still good, too.